Park Bridge has been closed. Motorists are facing an eight mile detour after a north-east bridge had to be closed due to structural defects. 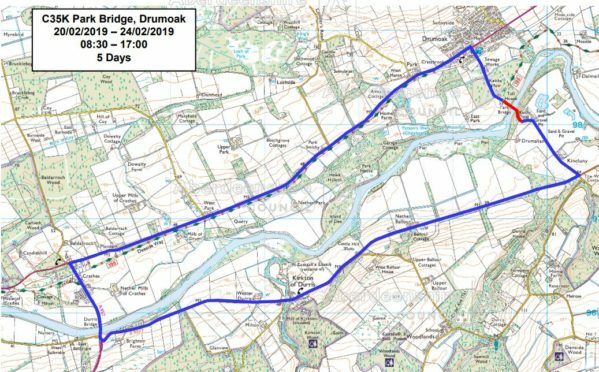 Park Bridge at Drumoak has been closed with immediate effect after the problems were spotted during a routine inspection. The bridge, which carries the C35K over the River Dee, will remain closed to all vehicles until further notice as a precaution. Further inspection work will be carried out over the weekend. The bridge will remain open to pedestrians and cyclists. The diversion route for vehicles is to cross the River Dee at the next bridge upstream – Durris Bridge near Crathes.